In Kerala, RSS activists are dehumanised to justify attacks against them as part of a political strategy. Kerala government has demonstrated that it will do everything it can to destroy the RSS. As part of this, there is systematic dehumanization and demonization of the RSS cadre by the Jihadi and Marxist controlled Media. This high decibel propaganda makes no further justification necessary to physically attack the RSS. Visuals from across the country are used for this purpose. Even incidents like caste conflicts in Tamil Nadu and Cow Vigilantism in Jaipur are blamed on the Sangh 24 x 7. The basic covenant of democracy that a government in power should represent and give justice to every section of its citizenry has long since been abandoned here. These responses are not one-off affairs. CPM State Secretary Kodiyeri Balakrishnan has gone on record with his infamous ‘Paadathu Joli, Varambathu Kooli’ which calls for instant retaliation against RSS. The Chief Minister recently stated that he had walked between knifes when he was a student at Brenan College and that he was not afraid of the RSS. Such statements by top leaders in the government and ruling party reaffirms the CPM’s political line and sets the backdrop for anti-RSS violence. The inauguration of the LDF government in Kerala in May 2016 signalled the start of a large scale offensive against RSS families in Kannur. Pinarayi, the home town of the CM Pinarai Vijayan, was the epicentre of this carnage. Houses just a call away from the CM’s residence were destroyed by mobs. The rampage went on for days and yet, the Chief Minister uttered not one word. There was no call for peace even as old men from RSS families, their homes ransacked, wept before TV cameras asking for protection for their women and children. The signal was clear – RSS and its sympathisers are outlaw sub-humans – fair game for anyone to attack and kill. Any retaliation by RSS was met with brutal Police crackdowns. In Kannur, Sudheesh, an RSS boy accused in an attack, was allegedly violated with an iron rod. In Attingal, RSS Karyalay was raided and RSS Taluk Pracharak hauled off. The Chief Minister himself has called upon a senior Police officer to investigate the charge made by a CPM activist against State Pracharaks. The partiality in granting parole for prisoners makes one tear up. All the Police stations are directly controlled by the CPM Local committees and there is constant provocation from the Marxist goons. There is not even a pretention of impartiality when it comes to treatment of RSS sympathisers. The election campaign for the Muslim dominated Malappuram LS seat is a classic example of how hatred towards the RSS is whipped up and used politically. Here, both the CPM and Muslim League are competing to project themselves as the most effective force against the RSS. Every dirty trick is being used to harass RSS sympathisers and thus to win brownie points with the Muslim electorate. The murder of Mohammed Riaz Moulavi at a Kasargode Madrassa on March 21 has become one of the main issue in this election. 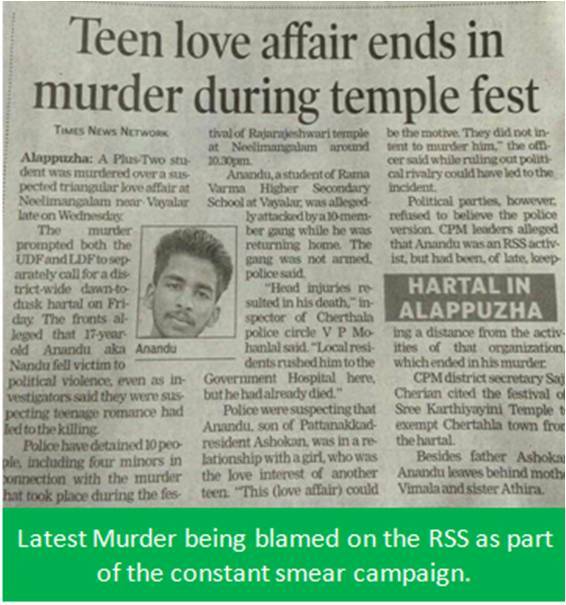 The CPM and its Media immediately blamed the RSS for the murder. The high decibel propaganda through TV and print media continued for days. This was picked up by other ‘secular’ Media and there was the usual chorus. The Indian Union Muslim League joined in and its cadre began attacking the outnumbered RSS sympathisers in isolated Muslim enclaves. Finally, Police investigation revealed that the murder was sequel to a drunken brawl at the Talipadpu ground on March 18. The Police report submitted reflected this fact that there was no RSS conspiracy to start a communal riot as alleged by the CPM. No RSS conspirators could be arrested as the CPM wanted. Even so, Media continued the ‘RSS’ angle. The Muslim League and the Congress are now blaming the CPM and the state police for ‘going soft on the RSS’. They want RSS leaders arrested somehow for ‘conspiracy’. The CPM which started the conspiracy allegation is now in a bind. To compensate for this ‘setback’ CPM has organised a hartal to protest the death of a student during a brawl among friends at a temple in Alleppey by calling it a murder by the RSS. In Kerala, Innocent or guilty, RSS men have to be arrested and locked up ! The CPM leadership is desperately looking for a constituency to replace the large scale erosion of backward class Hindus who were its main support base in Kerala. 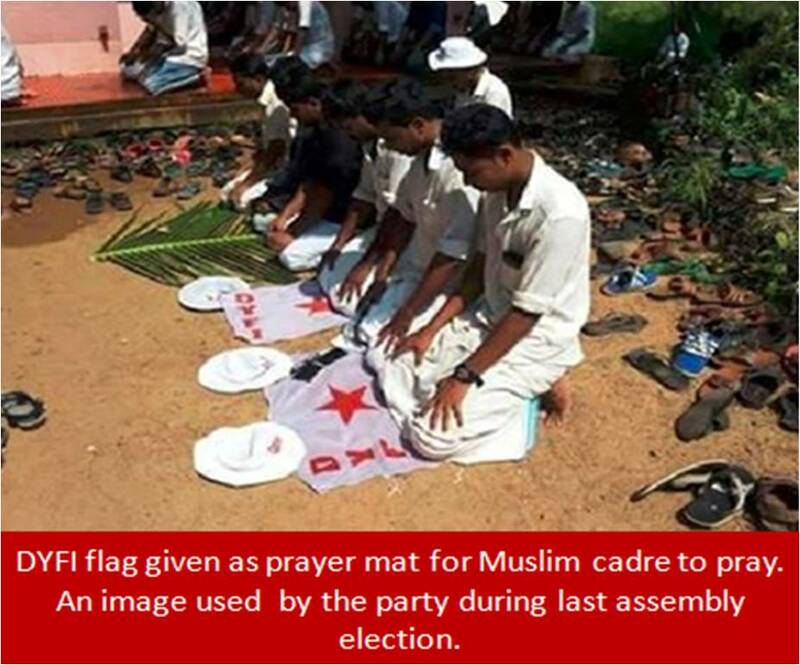 The party apparently believes that its future lies with winning the support of the Muslims in Kerala who account for 24.7% of the state’s population. The CPM has given many top posts of its affiliate outfits to Muslims. 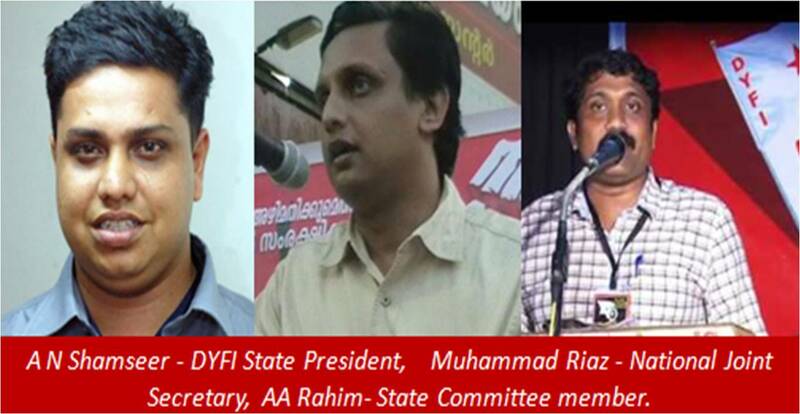 DYFI State President Shamseer, Raiz and Rahim are some of the leaders installed. Yet, the easiest way the party can appease the Islamists is by attacking the RSS physically even while keeping the pot boiling citing ’RSS attacks’ inside and outside Kerala. Every murder of an RSS Karyakartha, they apparently believe, will raise their support within the Islamic community by a notch. In short – demonizing and killing RSS cadre in Kerala is part of a political strategy and will not wilfully stop. I am haunted by the memories of a thousand deaths.